GETZVILLE, NY, UNITED STATES, January 12, 2018 /EINPresswire.com/ — Plodding through the ups and downs of everyday life is not always an easy task. 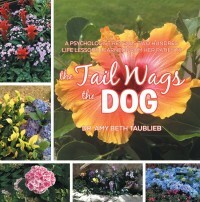 Dr. Amy Beth Taublieb's book entitled The Tail Wags the Dog – A Psychologist Reveals Two Hundred Life Lessons Learned From Her Patients provides words of wisdom to help each and every one of us deal with life’s trials and tribulations. In line with her goal of sharing valuable lessons learned from her therapeutic work with her patients, Dr. Taublieb will be releasing a video which summarizes what the readers can expect from her seminal new book. Rather than being filled with meaningless jargon and difficult to understand language, the video explains how this book is presented in easy to understand language, addressing practical issues to which all of us can relate. Dr. Taublieb invites all interested individuals to watch the upcoming video to glean a sense of how The Tail Wags the Dog differs from the typical self-help books currently available. Combining the clinical expertise of a doctoral level clinician with three decades of professional experience, with a direct, down to earth style Dr. Taublieb’s newest book has relevance to every person coping with the ups and downs of parenting, interpersonal interactions, relationships and various emotional disorders. Dr. Amy Beth Taublieb is a licensed psychologist who has been performing therapy and assessment in outpatient and inpatient settings for almost three decades. In addition to her therapeutic expertise, she is frequently called upon as a consultant to businesses for interpersonal mediation, to intervene with organizational employees when a psychologically traumatic event occurs, by the media to discuss issues of psychological relevance, and, to perform various assessments and to serve as an expert witness for the courts. Dr. Taublieb is also well known for her entertaining, yet informative workshops and in-services for professionals as well as the lay public. Finally, Dr. Taublieb is a regular contributor to various publications writing about a wide variety of psychological issues.